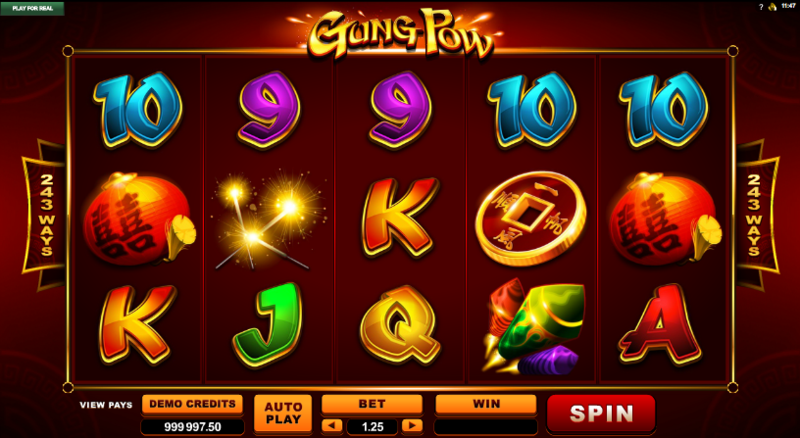 As Chinese New Year approaches it seems an appropriate opportunity to take a look at a brand new online slot from Microgaming; it’s called Gung Pow and while we have no idea what that means in English the theme of this game is fireworks and celebration. If you’ve previously played Microgaming’s Lucky Firecracker then you’ll already know what to expect – the two games are almost identical. 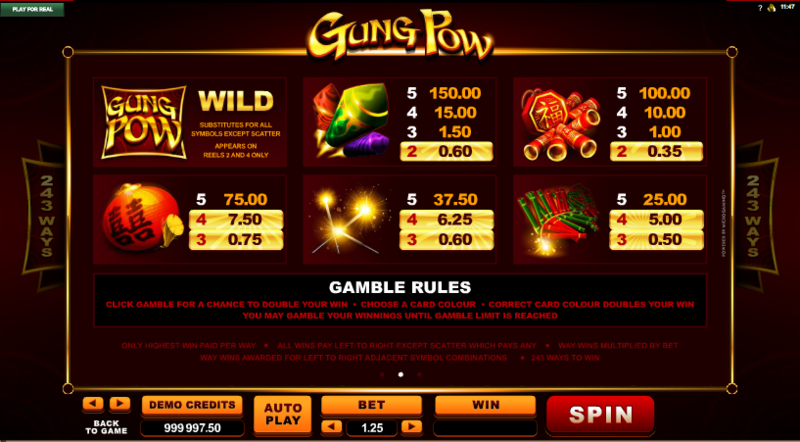 Gung Pow is a five reel slot with three rows and 243 ways to win; this means that winning combinations are formed by matching symbols on adjacent reels from left to right rather than any specific payline structure. The big, colourful symbols are enhanced by the plain, dark red backdrop. The high value symbols are a selection of fireworks – firecrackers, sparklers, rockets, etc – plus a Chinese paper lantern with the lower values represented by 9, 10, J, Q, K and A. The Gung Pow symbol is wild, substitutes for everything but the scatter and appears only on reels two and four. The Chinese dollar is the scatter which activates the main feature. This is the only bonus feature and it’s triggered by landing three or more of the Chinese dollar scatter symbols anywhere on the reels. You will now receive fifteen free spins as well as the scatter combination payout and all wins during this feature will be subject to a 3x multiplier. Landing three more scatter dollars during this round will add another fifteen spins on to your remaining total. A ‘Gamble’ button will appear above the ‘Spin’ button after any win so press it if you’d like to wager that win on a turn of a playing card. You just need to guess the correct colour of the next card drawn to double your win and you can win a maximum of five times in a row. There’s nothing wagon with this slot but it is virtually identical to Lucky Firecracker so you don’t really need to check out both unless you have a penchant for Microgaming/Oriental slots. It’s high quality though so perhaps it’s best to make up your own mind.